After a canceled tour and band turmoil that led fans to wonder whether Kings of Leon would ever release new material, the group has rallied back: they're set to release their sixth studio album, Mechanical Bull, on September 24. While further details are scarce, bassist Jared Followill told NME, "I thought we were going to make a really mature album but I'm amazed how youthful it sounds. It's like a mix of Youth & Young Manhood and Because of the Times." Rolling Stone can also confirm the band worked with longtime producer Angelo Petraglia in their new Nashville studio. 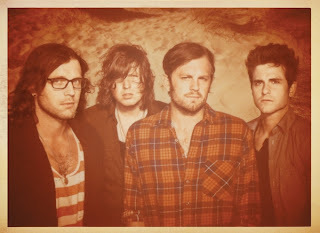 The Mechanical Bull announcement comes after a long period of fan speculation on the future of the band; the group scrapped a 2011 tour citing "vocal issues and exhaustion" after frontman Caleb Followill left a Dallas stage and failed to return. Jared Followill later tweeted: "I can’t lie, there are problems in our band bigger than not drinking enough Gatorade." KOL were scheduled to kick off a summer run on Friday at New York’s Governors Ball, but their set was rained out.